A salon chair rental situation is not good for stylists looking to make it on their own. A salon suite rental, however, is a perfect business opportunity with great profits, and you can find them at Salon & Spa Galleria in the Fort Worth area. Amber Russell, a master hair specialist at the Salon and Spa Galleria, shared this weekend about her experiences working at the Grapevine salon. With a wide set of skills ranging from hairstyling and corrective coloring to wax hair removal and hair cuts, Amber is confident that she can tackle any challenge thrown her way. Amber believes that the key to her success is the friendly relationships she builds with her clients. “I actually wind up making more friends than clients here. It makes it easier to know what someone wants with their hair if you actually know the person.” Many people will say that they make friends with their customers, but Amber has actually been to most of her clients’ houses. You can be sure that when she calls you her friend, she means it. For more information about Salon and Spa Galleria’s Amber Russell, you can visit her specialist page on their website at https://www.salonandspagalleria.com/our-specialists/amber-russell, or call her studio at (214) 277-3531. Master Hair Specialist Amber Russell Stands Out at the Salon and Spa Galleria in Grapevine. Fort Worth, TX – December 23, 2016 — Salon and Spa Galleria has acquired a new location at 1501 West Airport Freeway in Bedford, Texas. The 7950 square foot location, formerly occupied by Harrigan’s Bar & Grill, will soon become the newest location for Salon & Spa Galleria, a fast-growing salon-suite rental chain based in Fort Worth. “When a location with such great visibility from Highway 183 came on the market, we knew we had to pull the trigger quickly,” said Salon and Spa Galleria owner Ron Sturgeon. The location has a daily traffic count of 206,700 and has more than 217,000 people living in a 5-mile radius, according to a listing on the LoopNet commercial real estate site. “We anticipate that our Bedford Salon & Spa Galleria will open in the summer of 2017,” said Jennifer Knittel, Salon & Spa Galleria’s Operations Manager. “Because of the location, we’re already getting quite a few inquiries about leasing salon spaces in Bedford,” added Knittel. Salon & Spa Galleria offers beauty professionals a turnkey opportunity to lease space and all of the equipment necessary to open a salon. “Our other six salon locations have been very successful at attracting recent beauty school graduates and experienced beauty professionals who like the idea of building a following for themselves,” said Knittel. For beauty and health care professionals, the benefits of the Salon and Spa Galleria concept are numerous. Practioners can provide services with low overhead, set their own business hours, keep all the revenue they generate, and offer their choice of merchandise and products for sale. Amenities at all Salon and Spa locations include a custom work station or suite, on-site laundry, facility-wide internet, television and Wi-Fi service, and 24-hour, seven-day-a-week building access. To see a model suite or arrange a salon tour, contact Jennifer at (817) 823-7105. We all know that the main thing when you are looking for a place to set up shop, the first criteria is “location, location, location”. Having a shop in a prime location will set you up for success. Salon and Spa Galleria has 5 salons in the DFW area with great locations so that will no longer have to be a worry for you. Our Salon and Spa Galleria’s have beautiful salon suites and spa rooms for rent and we have a variety of sizes and prices to best fit you. If you are interested in booth renting but it may seem a little scary and have so many questions, well no need to be scared anymore. We can put your mind at ease with all the resources we have to offer. Our entire salon suites are customizable to what best fits your personality. Paint and decorate, express yourself through your walls. It is your space now so make it your own. The increased income that follows renting a booth is also extremely attractive, and with many booth renters doubling or tripling their take-home pay when compared to a typical commission situation, it’s a great opportunity. By leasing your own suite with us this could be the stepping stone if you eventually want to own your own salon. If you are ready to make the change and be your own boss, call one of our leasing managers today and make your dreams become reality. If you have a steady clientele, stop giving so much of your money to someone else. Take charge of your own business and make a change. 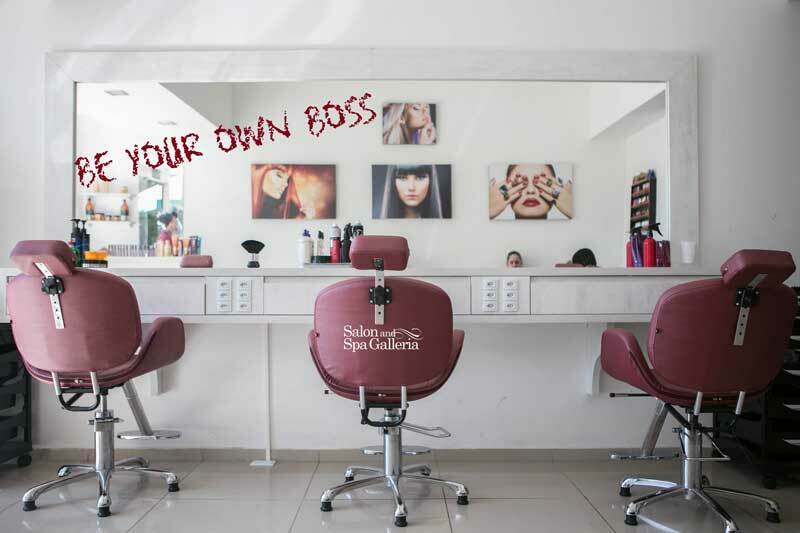 Become your own boss, make your own money, and make your own hours here at Salon and Spa Galleria. When you’re ready to make the move and start working for yourself, the next step is finding the perfect salon with amazing suites for rent. One of the main things in finding a salon is finding one that is in a prime location. It needs to be convenient for you and your clientele, and with Salon and Spa Galleria having 5 prime locations we guarantee we can find one that will best accommodate you and your clients. Booth renting is basically you owning your own business. You can set your own hours, be your own boss, sell your own product, make your own money and decide which services you can provide. All of our salons offer great move in specials right now and we are looking for talented individuals that are ready to start their own business and join Salon and Spa Galleria team. The driving force appears to be the desire to “be your own boss” and to enjoy the freedoms and benefits of becoming independent. Booth rentals are already prevalent in 55% of salons. Just give us a call today, set up a tour and see what we have to offer you and your business. We would love to add you to our salon. If you are want to get out of those commission- based beauty salons and want to get into an upscale booth renting beauty salon, come check out Salon and Spa Galleria Mansfield. We also have beauty salons for rent in Arlington, Grapevine and 2 in Fort Worth. With all of our locations we are bound to find you just what you are looking for. The beauty industry trends are pointing to the blooming booth rental market. It’s no question that this is the continued growth. It suggests that the beauty industry employment will grow steadily through 2017 at a nearly 6% annual rate. It is very rare to find a really good salon owner that rents out independent chairs with a clean, safe and fun atmosphere. At each of our facilities we have spa rooms and suites ranging in size and prices that will best fit your needs. You can sell product out of your suite, which will help increase your revenue by 15-20%. Another great thing about having your own suite is now you will be your own boss, make your own money, and make your own hours. Being a part of our team you also have full access 24/7 to the salon and 24 hour surveillance for you and your client’s safety on those late nights. Salon and Spa Galleria has many more incentives for you on this journey. Just give one of our leasing managers a call and set up an appt. today to tour any locations that best suits you. We would love to have you and your talents as a part of our team. We look forward to giving you a tour today! The trend of booth renting has become one of the most contentious trends in the industry. It is a form of hairdressing paradise if you are a trusted artist. It is very rare to find a really good salon owner that rents out independent chairs. But that is why Salon and Spa Galleria has been rated number one in the industry. We have 5 different locations in the DFW area and 2 and upcoming ones. With having a variety of locations to choose from we are sure to find you the perfect spot that will best accommodate you and your clientele. With it being said that the national average rate between 2012-2020 is expected to grow 16%. Don’t miss out on the chance of starting off early if you have the clientele and motivation to lease your own suite with us. Each of our suites is customizable to decorate and paint how you would like. We want you to make it your own, because it will be yours after all. Renting a suite is a small business within a business. You will also receive a 32 inch flat screen TV with Direct TV hookup while you are a part of our team. You can enjoy this incentive in your down time or it can be for your clients to enjoy while you are working on them. We also have 24 hour access to the salon for those late night clients and 24 hour surveillance for you and your client’s safety when you do have those late night work ins. Salon and Spa Galleria has many perks when signing on. Our goal here is to ensure our tenants are 100% satisfied if you want to become a part of our amazing salons give us a call set up a tour and sign with us today. Ah-yes… have the freedom to operate your own business in a private suite that is upscale. It’s a common crossroad for many established stylists to work for a salon or become a free agent. Always the dilemma… Booth rental vs. commission-based structure? Salon and Spa Galleria is the premier provider of salon suites in the DFW metroplex. We offer a variety of luxury, customizable, breathtaking suites for all types of beauty professionals. Our goal from day one has been to provide high quality, private individual salon suites enabling independent contractors in the beauty industry to operate and own their own profitable business. With all the amenities and incentives we provide, we have dedicated ourselves to creating and maintaining one of the most unique salons around. By renting a chair or suite from us your able to keep 100% for your time and effort and all your retail sales are yours to keep. Also when you rent with is we encourage you to express your taste through your suite, we want you to be proud to call it home. We have so much more, among many things we can offer each of our tenants either renting a chair, mat, mirrors, and cabinets available for you if those are things you have yet to acquire. We welcome all beauty professional to any location at Spa Galleria we have. Give one of our leasing managers a call and set up a tour so you can see for yourself why we have been rated number one in the beauty industry. We are all drawn to this industry because we know that we can have the freedom to be our own boss, grow our own business with no limits, determine how much money we make and be able to provide whatever services we wish to focus on and excel in them. If the beauty profession is your calling and you have put in the work to build your business for only success its time you take the last step and make it all your own and make all the decisions by renting a booth with us. We have built Salon and Spa Galleria to fully accommodate all our tenants in their journey of becoming their own boss. All you have to worry about is buying your supplies, paying your lease and making sure your client’s are 100% satisfied. We make sure that the building is clean daily, up-to-date on all inspections and regulations and all suites, bathrooms and vending machines are maintained and working at all times. When you sign on with us we provide you with a complimentary 32 inch flat screen TV with Direct TV hook up for you to enjoy on your down time and for your clients to enjoy while you are working on them. Also, at every salon location we have washer and dryers as well as supply laundry detergent for you to do your towels, capes, sheets, ect. So you don’t have to take your work home with you. We also have a digital directory at the front of each salon to direct clients where they need to go. And to better assist you in accommodating you and your clients schedule we give you twenty four hour access to the salon, and for you and your client’s safety and security we have twenty four hour surveillance inside and outside the building for those late nights. Come check us out and see our beautiful salons.